On the IVRPA sites (among other sites), I am using floated divs to create a gallery 'table'. Yesterday, Tessa and I joined some of her colleagues at a very enjoyable 'Parade'. 'De Parade' marks the start of the theatre season in the Netherlands. A group of theatre performers travels from city to city in a couple of weeks to try out their new theatre programmes. 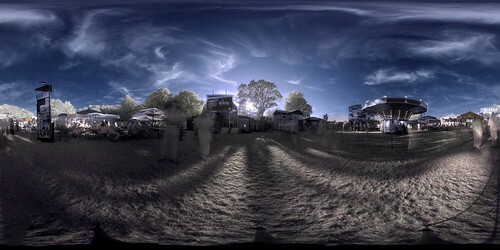 Since I'm still somewhat in love with my IR fisheye lens, I decided to do an IR shot of the sunset (pano). The IR filter blocks out most light, so with the waning light of the setting sun and at ISO 100, I ended up with an exposure of more than a second. I like the ghosting of the people in motion, while the rest of the image is sharp. The version above is what's called a 'false color' version; I have altered the colors so the sky is blue again, even though most blue light is blocked by the filter. For comparisson, here's the 'true color' version, which is more like what the camera saw.